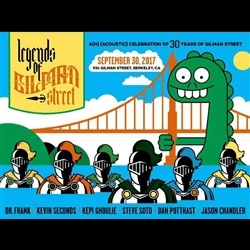 AMAZING poster for "An acoustic celebration of 30 years of Gilman Street" featuring Kepi Ghoulie, Kevin Seconds, Dr. Frank, Steve Soto, Dan Potthast and Jason Chandler. This is a limited, one time printing designed/Illustrated by Dana Lechtenberg (cargocollective.com/subpop2000). Screenprinted in Chicago by Screwball Press. There will be no added shipping fee at check out if you are in the continental US. You will have to choose "online delivery" from the drop down menu. If you are outside the US, please email anne@themachineshoprocks to get a shipping quote before placing an order. Thanks!